STINKIN’ CUTE! I’m still in Valentine mode, so while I’ve been seeing a lot of cards lately with other companies’ pandas, I turned to the pandas that I already have, which are these cute WPlus9 pandas from the Friends for All Seasons set. I stamped them, added some shading with Copics, and cut them out with my Brother ScanNCut 2. There are matching dies, which I have linked up below, but I don’t have them, and the SNC did a great job! I used the Drawn Hearts stencil from Simon Says Stamp with their Watermelon ink to create the background. 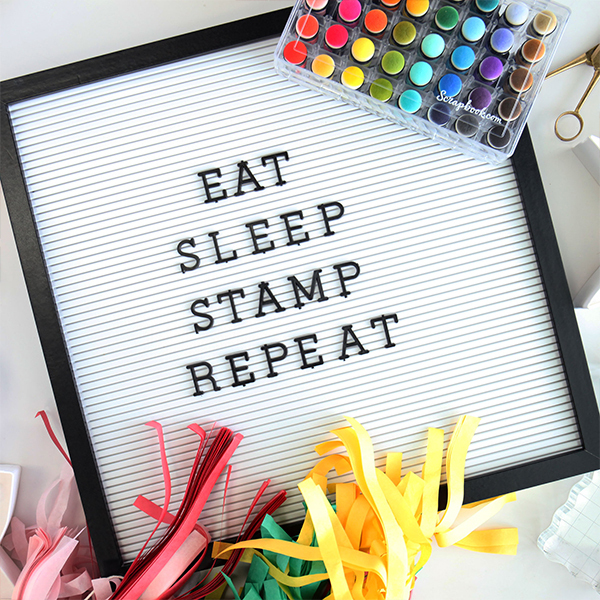 Then, because Simon doesn’t have Watermelon card stock, I hunted through my stash of pink card stock, and decided that retired Strawberry Slush card stock from Stampin’ Up! was about as close as I could get, so I cut the rounded rectangle from that and added some borders cut with Simon Says Stamp’s Sunrise Border die. The little hearts are also from Simon Says Stamp, the Mini Hearts Outline dies. I cut the plaid piece from Lawn Fawn’s Perfectly Plaid Winter 6 x 6 pad, cut with Simon’s Stitched Rectangle dies. The greeting comes from Tilted Banner Sayings with the matching Tilted Banner dies, stamped on black card stock and heat embossed. I love the dimension, don’t you? I also added a tiny dot of Sakura Clear Glaze pen over each eye to give them a little shine and dimension. A little baker’s twine was all that was needed to complete this cute Valentine!